The Good: The plot was very unique and interesting. The theme of what's morally right or wrong is definitely a thought provoking one to think about while watching. The moral decisions that had to be made will really challenge your own sense of morality. The suspense will keep you till the end. There are a good couple of "BOO! AHHH!" moments. Also the ending is very different and may be unpredictable. The Bad: The kids were STUPID and annoying as you could probably tell from the trailer. You don't know whether they are that dumb or if their parents should've done something else besides "time outs" when they were younger. There are some very predictable moments from the beginning, but you let it pass because it's obviously there to set up things later in the movie. The different ending may not woo the average movie goer, and I'm afraid some people may not appreciate the intent behind it. The Reason: This movie delivers exactly what people expected and it's purpose...to be unique. What's important to take here is that this movie is more so about it's theme and NOT so much about all the killing and violence. The constant theme of society vs morality is an interesting one that goes much deeper than the shocking, edge of your seat, thriller many people may be expecting. 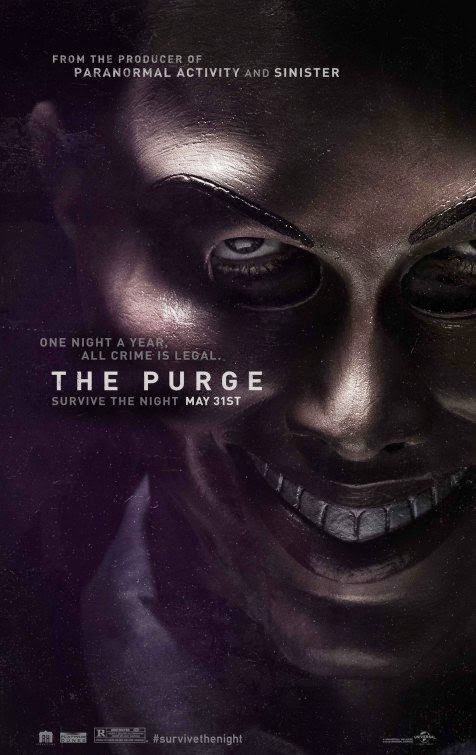 I think that if someone were to watch this, just keep in mind "What if society really was this way...would I Purge? Would I support the Purge?". Seeing as though this movie will make some people think more so than entertain, I think it will be debatable on how well this movie will be received. Personally, I say this is worth the watch mainly because this movie's theme will be unlike any movie we've seen as of late.